Celebrating the life of Charles L. Davenport, Sr.
Obituary for Charles L. Davenport, Sr.
Charles Luther Davenport was born on June 2, 1926 in Mount Pleasant, Texas to Luther Davenport and Toledo Phillips. Charles was a loving husband, father, grandfather, sibling, cousin and uncle to many nieces and nephews. Charles grew up with his family in Mount Pleasant, Texas. After serving in the United States Army, he moved to Denver, Colorado. 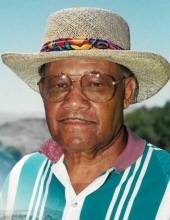 He attended night school and worked diligently to earn a business degree, which he put to great use as the first African American car salesmen in Colorado. Charles was a committed christian and eventually met the woman he would marry. On November 19, 1953, Charles married Margaret Ann Nelson. Charles and Margaret had three children, Charles Lawrence, Chari Lyn, and Cristofer Lamont. The Davenports lived in Park Hill on 3500 Dahlia Street for over 40 years before moving into Windsor Gardens. Charles lived in Denver for over 65 years and never grew tired of the view of his favorite golf course – Park Hill! He and Margaret were members of the Church of Christ for over 60 years. They were members of the Ogden Street Church of Christ and also the East Denver Church of Christ. They were founding members of Park East Church of Christ and spent their final years at the South Fulton Street Church of Christ. He served in several positions that included the transportation, business affairs, youth, and fellowship ministries, and he also taught Sunday school. He sang in the church singing group and served wherever he was needed. This legacy of Christian commitment lives on with his children and grandchildren. Charles had a wonderful life journey. He began working at Empire Oldsmobile and Honda in Denver as a mechanic and was soon promoted to salesman, where he would work for over 50 years. Many will remember his familiar voice on the radio when he would promote the dealership on KDKO by saying, “This is Charles Davenport from Empire Oldsmobile at 6160 East Colfax Avenue in Denver, Colorado!” He would include the latest deals and promotions for the week. He earned several awards for ‘Salesman of the Year,’ and for his dedication to quality customer service. However, working was not all that kept Charles busy! Earlier in life, Charles happily stumbled onto what would become his favorite pastime “playing golf”. In his younger years, Charles began a job as a caddy on a golf course where African Americans were not allowed to play. However, he often told the story of a man, who he caddied for, who would allow him to hit a few balls once they were out of sight of the public. Charles fell in love with the sport and this was certainly a contributor to his long and healthy life! Charles’ golfing hobby led him to travel and play on a variety of courses all over the United States, including the famous Torrey Pines golf course in LaJolla, California. In addition to playing golf, Charles enjoyed the beautiful mountain views in Colorado as well as long road trips. He was well-known for packing up the family station wagon and heading either into the mountains, or across the country. His children often talk about road trips where Charles would encourage exploring and enjoying the beautiful countryside! Charles was also an avid fisherman and spent many a day fishing for trout as well as supporting his favorite team: The Denver Broncos! Charles truly enjoyed his hobbies, and never allowed them to get in the way of taking care of his family. He was a Highlander Boys, Girl Scout, and Cub Scout dad. He attended every concert, play, and graduation to support his children. When Charles retired, he had a chance to explore the Colorado mountains more in depth, as well as, hone his golf skills. In the later years, Charles and Margaret joined the Fraternal Order of the Eagles where he enjoyed visiting and making new friends. Throughout Charles’ journey he touched all who met him. Everyone who came into contact with Charles noted his kindness and fun personality. Charles’ wife Margaret of 60 years preceded him in death in July 2014. He was also preceded in death by his siblings, Willie D. Davenport, Larry Davenport, Mary Ann Davenport, Irene Williams, Joe Rogers, Melvin Moore and sister-in-law Plummie Dancey. He leaves to treasure his memory his children Charles Jr., Chari Lynn, Cristofer and Billy (Joan), his fourteen grandchildren, eleven great grandchildren, and six great, great grandchildren. He is also survived by his brothers-in-law Johnnie Nelson, Irvin Nelson, Irwin Nelson and his sisters-in-law Donna Lou Harris, Pat Jackson, Dolly Lego (Arthur), and Edvernell Davenport and a host of nieces, nephews and cousins. Charles left us with an enduring legacy of love, kindness and loyalty that his family will treasure and continue throughout the decades to come. To send flowers or a remembrance gift to the family of Charles L. Davenport, Sr., please visit our Tribute Store. "Email Address" would like to share the life celebration of Charles L. Davenport, Sr.. Click on the "link" to go to share a favorite memory or leave a condolence message for the family.